In this final part of the Golf Analyzis section, Percy Boomer briefly analyzes a young boy's swing"
It's a wide swing. Left arm straight, left wrist fully brokenback. The shoulders are still turned away from the ball while the hips are turned towards it, giving body flail. The left leg has straightened, but the wrists are still broken back. Shoulders now square with the line of flight. Up on the toes, stretching upwards through the body so that the wrists will snap open downwards. Left heel back to the ground. Right arm straight . . . elbows still held together. 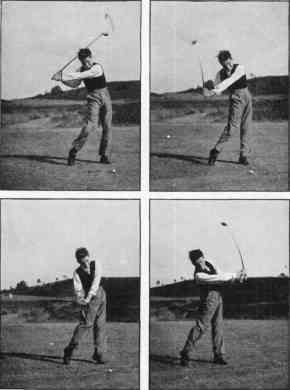 In the sequence, the hands, and consequently the club head, have come down yet along. In position 2 and 3 the right leg is too stiff. He is looking at the ball with his right eye instead of "peeping at it with his left eye."